Yes. Jesus said, “Every branch that beareth fruit, he purgeth it, that it may bring forth more fruit” (John 15:2). Purge means that He “prunes it, or cleanses it by pruning”[popover title=”Source” title_bg_color=”” content=”Albert Barnes. Barnes’ Notes.” content_bg_color=”” bordercolor=”” textcolor=”” trigger=”hover” placement=”” class=”” id=””]*[/popover] Pruning is an important process in vineyards—some say it is the most important part of the entire operation. If a vinedresser is good at pruning, he can make the same vines produce much more fruit. If he is a poor pruner, the harvest will suffer. After His Old Testament vineyard, Israel, disappointed Him, He asked, “What could have been done more to my vineyard that I have not done in it?” (Isaiah 5:4). God is working on us today: “It is God which worketh in you both to will and to do of his good pleasure” (Philippians 2:13). We are promised that He “is able to do exceedingly abundantly above all that we ask or think, according to the power that worketh in us” (Ephesians 3:20). He is working on you and me to enable us to produce “fruit” (John 15:2), “more fruit” (John 15:2), “much fruit” (John 15:8). None of us has ever been “pruned” literally, so we lack a physical frame of reference for the spiritual process. We may have had our hair shorn against our will as children or in a few cases scrubbed when we resisted, but spiritual pruning feels unnatural and invasive. Let’s consider the process from the perspective of the vine. How does a vine feel when being pruned? The first feeling of the vine is a sense of relief. Pruning removes the dead wood that can breed disease and insects, and makes the vine lighter and more attractive. God does this for us. In conversion, He removes from us our guilt and condemnation (Romans 8:1). In time, He cuts away the habits that bind us (1 Peter 2:11). Gradually, He trims our excesses and teaches us moderation (Philippians 4:5). God puts life back into people. Like an old photo left in the sun, the life of sin sooner or later loses its color. Like an iced drink left out too long, it goes flat. Like week-old bread, it gets stale. Like a game played too often, it loses its appeal. God prunes away the old to invigorate, freshen, revive, and renew our lives (Psalm 51:10; Isaiah 40:31). When the long-missed prodigal returned, his father urged his older brother to accept him, reasoning, “It was meet [appropriate] that we should make merry, and be glad: for this thy brother was dead, and is alive again; and was lost, and is found” (Luke 15:32). Paul said, “Even when we were dead in sins, hath quickened [made alive] us together with Christ” (Ephesians 2:5). The Father uses the Word to cleanse and refresh us. In this context, Jesus continued, “Now ye are clean through the word which I have spoken unto you” (John 15:3). Paul wrote of the cleansing power of the Word: “That he might sanctify and cleanse it with the washing of water by the word, that he might present it to himself a glorious church, not having spot, or wrinkle, or any such thing; but that it should be holy and without blemish” (Ephesians 5:26-27). To quote William Clark upon finally seeing the Pacific Ocean[popover title=”Source” title_bg_color=”” content=”On the Lewis and Clark Corps of Discovery Journey (or at least what he thought was the Pacific).” content_bg_color=”” bordercolor=”” textcolor=”” trigger=”hover” placement=”” class=”” id=””]*[/popover], “Oh, the joy” of Christianity! To tired people Christ says, “Come unto me, all ye that labour and are heavy laden, and I will give you rest” (Matthew 11:28). To those burdened by sin and life’s hardships, Jesus promises: “Take my yoke upon you, and learn of me; for I am meek and lowly in heart: and ye shall find rest unto your souls. For my yoke is easy, and my burden is light” (Matthew 11:29-30). To those who are troubled, God has a good word: “And to you who are troubled rest with us, when the Lord Jesus shall be revealed from heaven with his mighty angels . . . When he shall come to be glorified in his saints, and to be admired in all them that believe (because our testimony among you was believed) in that day” (2 Thessalonians 1:7-10). To those who feel lost, Jesus says He is “the way” (John 14:6). To those who feel guilty, He insists, “There is therefore now no condemnation to them which are in Christ Jesus, who walk not after the flesh, but after the Spirit” (Romans 8:1; cf. John 5:24). To those who fear death, Jesus assures: “In a moment, in the twinkling of an eye, at the last trump: for the trumpet shall sound, and the dead shall be raised incorruptible, and we shall be changed. For this corruptible must put on incorruption, and this mortal must put on immortality . . . then shall be brought to pass the saying that is written, Death is swallowed up in victory. O death, where is thy sting? O grave, where is thy victory? The sting of death is sin; and the strength of sin is the law. But thanks be to God, which giveth us the victory through our Lord Jesus Christ” (1 Corinthians 15:52-57). To those who fear that God has abandoned them, He says, “I will never leave thee, nor forsake thee” (Hebrews 13:5). David added, “I have been young, and now am old; yet have I not seen the righteous forsaken, nor his seed begging bread. He is ever merciful . . . For the Lord loveth judgment, and forsaketh not his saints; they are preserved for ever” (Psalm 37:25-28). To those who feel that God is angry with them, He has a comforting word: “Therefore being justified by faith, we have peace with God through our Lord Jesus Christ” (Romans 5:1). Those who feel God is inaccessible are told, “By whom also we have access by faith into this grace wherein we stand, and rejoice in hope of the glory of God” (Romans 5:2). The next step in pruning is to cut back the living vine so it will not waste its nutrients and moisture feeding vine instead of fruit. Left to itself, the vine produces all kinds of growth, but not the kind which bears fruit. The vinedresser even cuts away whole bunches of grapes as they begin to form, if he feels more are growing than the root system can support. He wants both quantity and quality, and will not sacrifice quality for quantity. God also cuts away from us some things that hurt at times. He uses his fingers to pinch off dead blooms. He uses clippers for selective pruning and removing a spike or rogue shoot. He uses shears to shape plants for a well-rounded appearance. He uses a saw to cut heavy wood to restructure the plant. [imageframe lightbox=”no” gallery_id=”” lightbox_image=”” style_type=”bottomshadow” hover_type=”none” bordercolor=”” bordersize=”0px” borderradius=”0″ stylecolor=”” align=”left” link=”” linktarget=”_self” animation_type=”0″ animation_direction=”down” animation_speed=”0.1″ animation_offset=”” class=”” id=””] [/imageframe]When we came to Christ, many of us brought baggage from our old lives—old habits, attitudes, and ways of thinking about others and ourselves. The Vinedresser set to work cutting away anything that does not look like Christ (2 Corinthians 3:18). As time progresses He chastens us to make us more fruitful (Hebrews 12:1-11). Amy Carmichael wrote, “A wise master never wastes his servant’s time.” No matter what happens to us, God is not wasting our time. He is educating us; He is improving us; He is molding us. There are some “mountain heights” of spirituality that can only be reached by going through the “valley of suffering” (2 Thessalonians 2:10-12; Psalm 119:71). Hard times can build good character (James 1:2-4; 1 Peter 1:7). Ralph Waldo Emerson was once approached by a concerned and inquiring person who said, “Mr. Emerson, they tell me that the world is coming to an end.” Emerson calmly replied, “Never mind, we can get along without it.” We all need to learn that we can “get along without” the world. The older woman replied, “He is making you now.” God’s purpose is to prepare us for heaven. Pruning tests our faith (Genesis 22:1). It tells whether we are “gold, silver, precious stones” or “wood, hay, stubble” (1 Corinthians 3:12-15). The worthiness of the ship is not determined while it lies in the harbor but when it rides the waves of a storm. Our faith too must be tested during life’s storms. Pruning makes heaven more attractive to us (2 Corinthians 4:16 – 5:1; Hebrews 11:10; Colossians 3:1-2). One observed: “It is through our tears that we see the farthest into heaven.” Perhaps Paul suffered more than any other New Testament Christian; he also seems to have been the most attracted to heaven. He said, “For to me to live is Christ, and to die is gain. But if I live in the flesh, this is the fruit of my labour: yet what I shall choose I wot not. For I am in a strait betwixt two, having a desire to depart, and to be with Christ; which is far better” (Philippians 1:21-23). If a vine’s branches could speak, they would eventually rejoice at how they look and how much fruit they could produce. Pruning hurts, but it also helps. We may not enjoy it, but we need it. At the time, it hurts when He removes something precious from us; but as the spiritual crop is produced, we see that the Father knew what He was doing. The end of the process produces a self-satisfied, “Wow!”—like when the hair stylist finishes and a lady sees how much better her appearance is. We can never say, “Well, I’ve been through that, and I’m glad that’s over.” The pruning process doesn’t happen all at once, or once for all. It takes a lifetime. The heavenly Vinedresser continually removes from us what hinders our productivity. Light in a dark world (Psalm 119:130). Understanding in a wondering world (Psalm 119:130). Knowledge in an ignorant world (Proverbs 2:6). Approval in a rejected world (2 Timothy 2:15). Stability in a floundering world (James 1:3-6). Domesticated bullfinches are placed in a dark room for weeks before learning to sing. When brought back into sunlight, their song is sweeter than it would otherwise be. 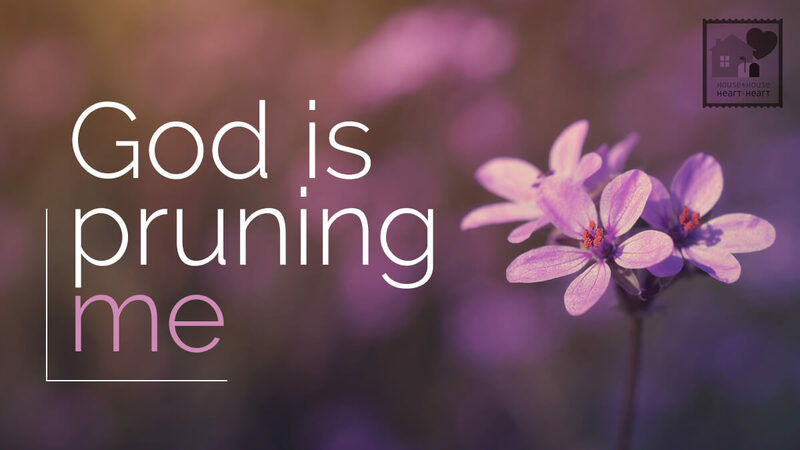 God takes us into the dark room of suffering so that when we come back into life’s sunshine, our song of praise will be sweeter than ever before. The Vinedresser knows what He is doing. Wonderful article Allen. 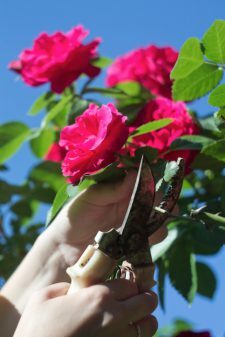 Some Excellent points on pruning I have never used. I have been preaching for 35 years and gardening for 47 years, learning from Our Master Teacher. Thank you for the great message.